Background: Why are clouds white, the sky blue and rainbows colorful? It all has to do with light. Light is made up of different wavelengths, which combined together appear white to us. When light passes through glass and/or water and is bent, the component wavelengths separate and we see different colors. 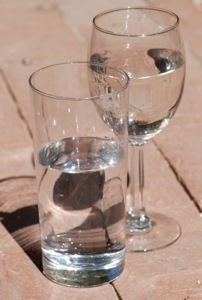 Set the glass of water in the direct sunlight. If you don’t see a rainbow appear on the surface behind the glass, lift slightly and tilt back slightly. You should see a colorful, arching rainbow. Sometimes more than one will form to the side, as well. Place a white paper behind the glass to make the rainbow stand out more clearly. Hang the crystal in a sunny window, south facing is best. 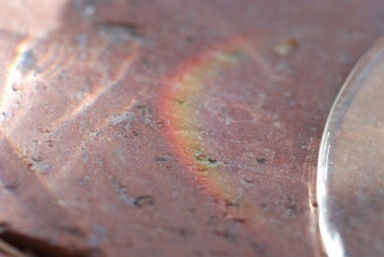 Look for rainbows on walls or the floor throughout the day. Track how the rainbow(s) move from hour to hour and day to day with the sun’s movement. Pieces of painters’ non-sticking masking tape or post-its work great for this. Label the tape with the time and date and stick it on the rainbows as they appear for a visible record of the changes. Go outside on a sunny day. 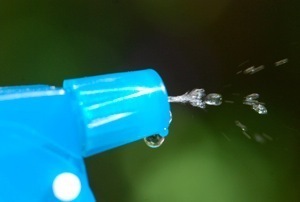 Use the hose or mister bottle to throw fine droplets of water into the air. Look for rainbows. This is pretty much how rainbows form on rainy days. If the sun comes out while it is gently raining, look for rainbows. The rainbows form when sun passes through the water in the raindrops.